The act of removing our wild horses and burros off of public land draws attention to the issue. However the roundup is the moment we have failed to manage our wild horses on the land. 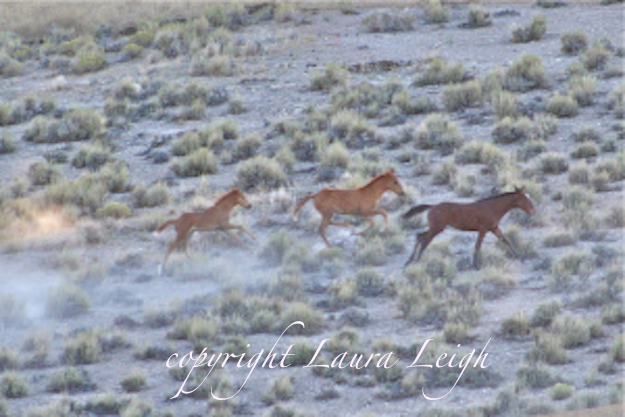 There are two very distinct parts of the BLM Wild Horse and Burro Program. Everything that happens to a wild horse before the roundup is controlled at the field and state level; paychecks for employees come from an allotted amount to each state. Everything that happens after the wild horse when it enters the holding system is controlled by a national hub; paychecks for employees come direct from that hub. Employees that operate at the field level are not intimately involved in holding. Employees at facilities are not intimately knowledgable about the range program. However both will present as an "authority" for the other as the memo simply gets repeated. Instead of admitting a deficit of knowledge many simply speak and it can cause a lot of misinformation. Management on the range is actually made more difficult by large scale removals. Large scale removals increase birth rates in a destabilized population. In a program void of basic data we continue an archaic system of wild horse management that has not changed much in nearly 50 years. WHE has designed, has assisted in designing, has been advocating for a decade; large scale data protocols with a temporary fertility control component. We can slow birth rates as we generate sound management practices based on ground data, not politics or old bad habits. Every project we have worked years to begin to actualize has been suspended by the federal government without legal, moral or ethical reasons. Our documentation includes multiple instances of avoidable injuries, abusive actions and intentional neglect. Wild horses left with no water after capture and a contractor refusing to refill tubs in triple digit heat. Foals electric shocked. 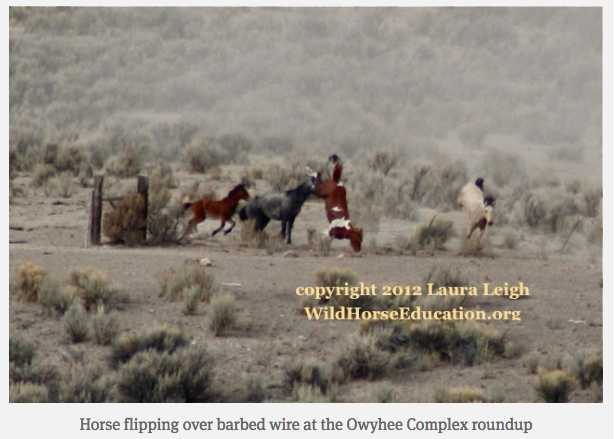 Wild horses kicked in the head, dragged with a rope, trailer doors slammed on legs causing injury. Foals run to collapse. Our documentation has even shown a helicopter hitting a horse with it's skids. There are distinction between intentional injury, intentional neglect, preventable injury and an unforeseen event. Years of first hand, extremely extensive, documentation led to acceptance of our founder as an expert witness to roundup protocol during litigation. 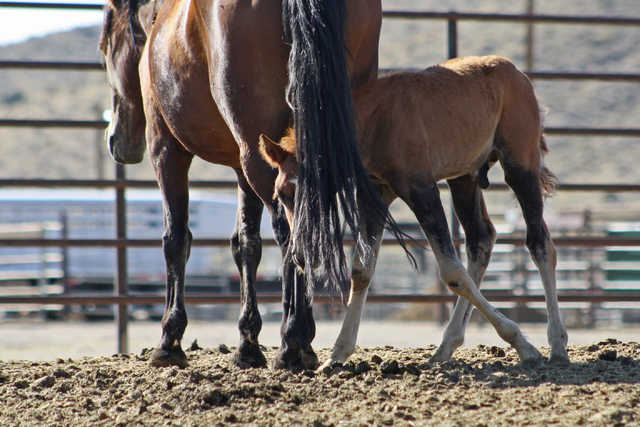 Our work was the driving force to create the first humane handling policy for our wild horses. The policy needs revision and better enforcement. For roundup photos go to our archives by clicking the button below. We are updating this site to include roundups by date and place. But be patient, we are still using the blog format for current roundups and you can find them by scrolling or using the search bar by clicking the button below. 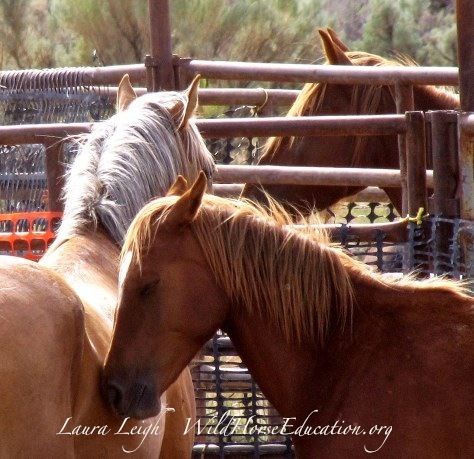 After capture wild horses are separated from family and shipped to holding facilities. There wild horses are branded and entered into a system of inventory. 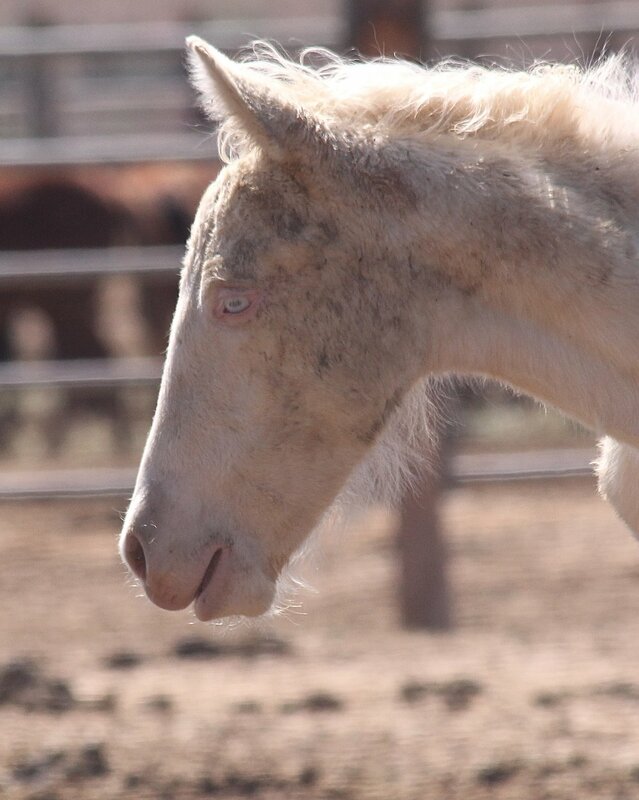 Prior to a foal being branded at 3-5 months of age it does not appear in inventory. Foal mortality and spontaneous abortion (miscarriage) post capture are not tracked in a statistical data base. If a wild horse survives capture it has to survive in holding. Death statistics post capture have been removed from the BLM website. In one winter roundup at the Eagle Complex the death toll in a closed door facility (Broken Arrow, Indian Lakes) rose to dozens of horses each week from broken necks, broken backs and respiratory illness. BLM currently has no national protocol for infectious disease in facilities. If a wild horse is adopted or sold the dangers do not end there. 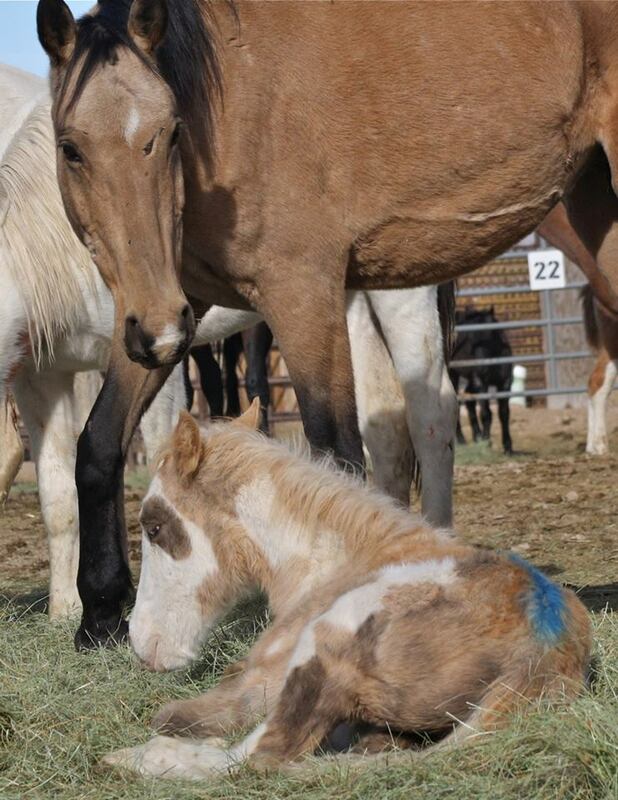 BLM runs an adoption program where a wild horse retains it's status as federally protected for a one year period. After that the adopter gets a title, much like on a car, the wild horse loses it's status as "wild" and is governed by the same laws as any domestic horse. 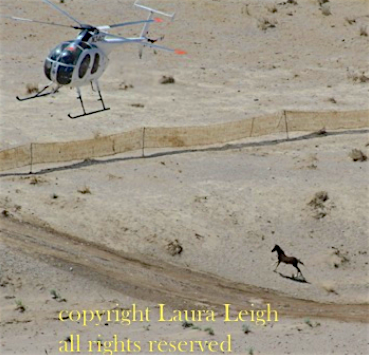 BLM also runs a "sale program" where a wild horse can be purchased for as little as $5. In 2012 an investigation into the BLM sales program uncovered nearly 1800 wild horses sold to one kill-buyer for $5. each. At an Advisory Board meeting in 2016 the board voted to "fast track" wild horses into the sales program. Mustangs showing up in kill pens have increased steadily. It is unknown at this time if this is due to the larger number of wild horses being sold to clear holding pens (inventory dropped by nearly 20,000 wild horses in a 18 month period). BLM does not keep inventory records online and BLM FOIA offices are not answering difficult requests, including inventory and sales. Now that BLM has space in holding the restrictions on removals are lifting. BLM roundup numbers are increasing to satisfy profit driven interests on public lands. This video was first released in 2011. In the multiple release formats it has been viewed over 5 million times. 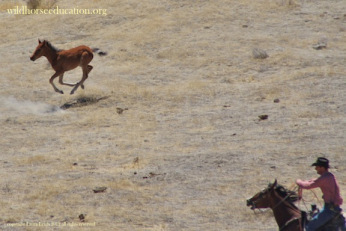 At Wild Horse Education we get multiple requests each day asking us to search for an adopters mustang in our roundup photos. We try to answer each request but our time is limited. We realize that your mustang is "not just a number." We wish BLM did too and provided you with a photo at intake or roundup.